Zoom is an in-office teeth bleaching system from Discus Dental. It delivers dramatic results in only one office visit. Combined with take-home bleaching as a follow-up, it can whiten your teeth dramatically. The powerful whitening gel contains high levels of peroxide. This bleaching agent is activated by a special Zoom light that releases oxygen to eliminate years of staining and discoloration. This powerful whitening system noticeably brightens the enamel and dentin of your teeth, up to 10 shades whiter. After only three, 15-minute sessions of the Zoom whitening system, your teeth will be permanently whiter. Even if you gradually pick up stains down the road, your teeth will always be whiter than they were before using Zoom. Placement of the retractors and a napkin are the first step to protect and help cover your lips. In order to protect your gums, a rubber coating is applied over your gum tissue. Then, it’s time for the Zoom gel to be applied to the surface of the teeth. When the Zoom light shines on your teeth, the gel is activated. This important step breaks up the stains as the bleaching agent penetrates deep into your teeth. You can relax and listen to music while you wait. That’s it! After three rounds of 15-minute whitening sessions, you will have a dazzling, white smile you will be proud to show off. Dr. Coleman was recently featured in Cosmetic Town where he explained the Zoom Whitening procedure. 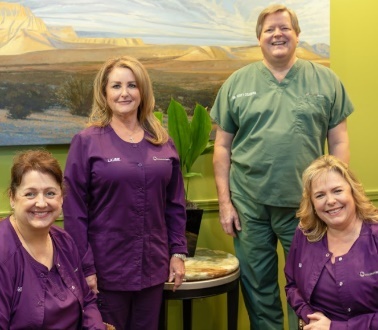 He shared details about what to expect before, during, and after the procedure, as well as the results you should attain. Read the full article by clicking on the icon.